Uncasville, Conn. – Preseason is the time where teams get the chance to onboard rookies and free agents, build chemistry, and whittle the squad down to a 12-woman roster. This time is far from stable for any given team, as players are coming in-and-out of training camp due to cuts and overseas arrivals. The Connecticut Sun seem to have perfected this turbulent time with a flawless 8-0 record over the last three seasons, and a 15-2 mark that dates back to 2013. The next closest unbeaten streak comes from the Washington Mystics and Seattle Storm, who both are 2-0 during the 2018 preseason. Although the Sun are happy with its results, they know that the preseason doesn’t always yield Championship results. They remember the lessons of the 2017 season well, and know that what matters is how they finish, rather than how they start. All-star forward Chiney Ogwumike echoed this sentiment recently. Head coach Curt Miller also is not content with preseason success. 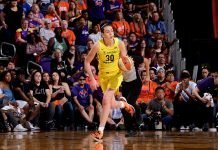 After making the playoffs last year for the first time since 2012, but ultimately getting knocked out in the elimination round by Diana Taurasi and the Phoenix Mercury, Connecticut knows there is no easy road ahead. Despite their 3-0 preseason start last year, they went 1-6 to start. Connecticut is primed to kick off the 2018 campaign on the right foot next Sunday, when they host the Las Vegas Aces.